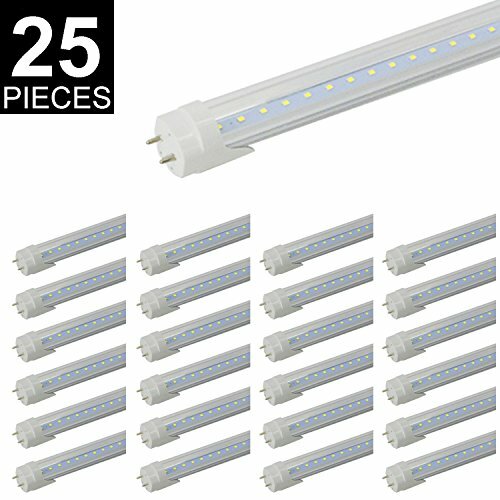 (US STOCK) 4FT T8 LED Light Tube, CNSUNWAY Lighting 22W (45W Fluorescent Replacement), 6000K (Super Bright White), Single Row 2 Pin G13 Bulbs (25-Pack) by CNSUNWAY LIGHTING at Blog Free Here. MPN: SW-4FT-CC-22W-25. Hurry! Limited time offer. Offer valid only while supplies last. (Fast shipping from USA) ENERGY SAVING - Save 52% on your electricity bill! Replace 45W fluorescent tubes with 22W LED Tubes. DON'T NEED BALLAST - Existing ballast needs to be removed or by-passed,easily fitted Instead of traditional fluorescent tube lamps. HASSLE-FREE WARRANTY - CNSUNWAY LIGHTING offer 5-year unlimited warranty means we've got you covered! Contact us for an easy and fast replacement.